Bangladesh continues to make important strides towards greater social and religious freedom, turning its back on the trend towards cultural and religious isolationism seen too often as a reaction to Western cultural encroachment. That's not to say that Bangladesh is losing any of its national character or sanskriti - in fact, it's arguable that they're preserving it. Last week the Education Ministry directed authorities not to force women or girls to wear veils or religious attire. Unlike the Shah's ban on veils in Iran - and the subsequent forced veiling under the Ayatollahs - Bangladesh has chosen to let individuals practice religion as they see fit. K. Anis Ahmed writes in today's Wall Street Journal that this "secular revolution" is largely the result of women's empowerment in the country. Credit women's empowerment, which provide not only a sign of societal progress, but also remain its most salient cause. The prime minister and the opposition leader are both women. The foreign affairs, home and agricultural ministries are all run by women. Women hold top jobs in government, banks and business, and are especially prominent in legal, medical and social industries. They excel in art, culture and sport. They serve in the armed forces and fly planes for the national airlines. In the lower socio-economic spheres, women work in agriculture, microfinance and the garment industry. Tens of millions of women are economic decision-makers. Of course the struggle for gender rights and equity still has a long way to go. But the attempt to achieve these worthy goals, led mainly by nongovernmental organizations, has also increased social resiliency against religious fanaticism. In fact, it's not a stretch to argue that the government's actions to stem Islamism could never have been imagined without society's secular backdrop. The truth is, radical political Islam is an invention of clerics such as Muhammad ibn Abd-al-Wahhab who, despite their stated intention of removing innovations in the religion, actually did more innovating than anyone else. This new political Islam became a convenient rallying cry for tyrants and dictators who imposed foreign and often invented cultural mores onto their countries. Bangladesh has a strong and proud Islamic tradition, but they also have a deep and proud national culture. The two are complimentary, and by trusting the people to live and worship as they see fit, the state is doing a good job of ensuring that they preserve both. The following Op-Ed by Babar Ayaz originally appeared in the Pakistani English-language daily, Daily Times. The Bangladesh Supreme Court has courageously restored ‘secularism’ in the country’s constitution. The court also said that religious parties should be banned. The appellate division of the apex court said: “Preamble and the relevant provisions of the constitution in respect of secularism, nationalism and socialism, as existed on August 15, 1975, will revive.” That was the tragic date when the young Turks of the army assassinated Sheikh Mujibur Rehman who led the liberation struggle. But the country’s Attorney General Mahbubey Alam said the country would however remain an Islamic republic. He also maintained that ‘Bismillahir Rahmanir Rahim’, which is not in the original 1972 Constitution but introduced subsequently by a military-led regime, would be retained. He also said that the country would continue with its present name: the “Islamic Republic of Bangladesh”. To defuse a strong reaction by the Islamist parties, Prime Minister Sheikh Hasina said she had no intention of banning such parties that are recognised by the Election Commission, although the restored portion of the constitution disallows functioning of religious political parties. Bangladesh’s largest Islamist party, the Jamaat-e-Islami (JI) had collaborated with the Pakistani army during the military operation in 1971. It is also alleged that the JI’s youth were responsible for the mass murder of the Bangladeshi intellectuals in 1971. While Sheikh Hasina is right in not jumping to outlaw the religious parties, she would have to find a legal window to resist the implementation of the Supreme Court. Banning political parties does not make sense in a democratic structure as the banned parties can re-launch a party with a new name just like it happened in Turkey. It is also good to keep these parties engaged in the democratic process, otherwise they are likely to go underground and be led by the militants within the party. The Awami League that led the Bangladesh liberation movement had envisaged a democratic secular polity in the country and was fully conscious that democracy sans secularism is incomplete. The move to secularism was also a consequence of the rise of Bengali ethnic solidarity that negated the basis of the ‘two nation theory’, which gave an overwhelming role to religion in Pakistan. Exploitation of East Pakistan by West Pakistan contributed to the rise of ethnic politics in Pakistan. Although the Muslim League was born in Dacca (Dhaka) in 1906, it was realised by the Bengali politicians that the political formulation that Muslims of India are a separate nation was incorrect. That was one of the major reasons that led the politicians of the new nation to opt for secularism. So when the Bangladesh Supreme Court gave its verdict in favour of secularism and asked for banning political parties formed on a religious basis, it was upholding the dream of the founding fathers of the Bangladesh constitution. Both Pakistan’s and Bangladesh’s experience has shown that the formation of political parties on the basis of religion has widened the gulf between various sects of Islam. The manifesto of these religious parties is also in conflict with globally accepted human rights. The logical outcome of the political formulation of declaring a country as an ‘Islamic Republic’ is that equal rights are denied to the minorities and it gives more space to religious fundamentalism. We have seen both in the case of Pakistan and Bangladesh that the minorities’ ratio in the population has been shrinking since 1947. Because of a more tolerant attitude of Bengalis towards the minorities, the migration of Hindus and Christians was less than Pakistan. According to Bangladesh’s 1991 census, the religious and ethnic minorities stood at 12.6 percent, as compared to less than 5 percent in Pakistan. The Hindus are 10.5 percent (12.5 million), Christians (0.3 percent), Buddhists (0.6 percent) and other religious minorities (0.3 percent) in Bangladesh. Hindus, mostly Bengali-speaking, are the biggest religious minority community and they are scattered all over the country. Similarly, Christians are also scattered all over, but the Buddhist population is largely concentrated in Chittagong, the Chittagong Hill Tracts and Patuakhali. As the basic secular structure was changed after the 1975 bloody coup, the minorities started feeling insecure and discriminated against. The Khaleda Zia government, which wanted to keep the Islamists appeased, failed miserably in protecting the Hindu minority in the riots that followed the Babri Masjid demolition incident by Hindu extremists in India. The Islamic parties, claiming that she had committed blasphemy, hounded Dr Taslima Nasrin out of the country for recording the brutal killings of the Hindus in her novel Lajja, a charge that cannot be proved even when you go through her novel with a fine toothcomb. Instead of expediency politics, the Awami League should take this opportunity to restore the country’s original name, ‘The People’s Republic of Bangladesh’, because you cannot be an ‘Islamic Republic’ and be secular at the same time. Similarly, to be a true democracy Bangladesh should also treat non-Bengali speaking people of the country equally and expunge such clauses from the constitution that talk about Bengali nationalism instead of Bangladeshi nationalism. Such clauses support majoritarianism and seclude the minority ethnic groups of the country. Coming back home, our establishment should realise that terrorist attacks by militant Islamic groups and discrimination and victimisation of minorities in Pakistan cannot be stopped unless Pakistan corrects the historic mistake and re-launches itself as a secular democracy. Though their problems are not as compelling as that of Pakistan, Bangladesh’s Supreme Court appears to be centuries ahead of its Pakistani peers and the Pakistani establishment. Reading about the upcoming hartal, I was curious as to why there was suddenly a return to the practice after a three-year hiatus. Rezaul Karim provides some insight, though, in today's Daily Star. BNP opted for street agitation as it feels it failed in its secret bid to reach an understanding with the government that the latter would not make a move on Khaleda Zia's Cantonment house, and would withdraw the cases against the party chairperson and her two sons. A highly placed BNP source told The Daily Star, on condition of anonymity, that his party had offered to refrain from street agitation in exchange for an assurance from ruling Awami League that the government would withdraw the "false" cases. Soon after AL came to power in January last year, BNP said it would not announce hartals, and blockades. AL's initial response was positive, indicating that it would not embark on tough actions against Khaleda and her family -- if BNP refrained from street protests, and from bringing Tarique and Koko back to the country and politics. The ruling party's expectations echoed the expectations of some European countries that also had been asking BNP to keep a distance from Jamaat, and to refrain from trying to bring back Tarique Rahman into politics because of his tainted image. Accordingly, till a few months back, BNP maintained a distance from Jamaat, and refrained from harsh criticism against the government, and street agitations. The "friendly" gesture faced its first major blow in April last year, when the cabinet decided to cancel the lease of Khaleda's Cantonment house on grounds of a faulty lease. The government took the decision against the backdrop of the Pilkhana tragedy, as it had information that Khaleda was secretly meeting army officers in her residence right after the mutiny. After some initial war of words between the two parties, BNP renewed its demand that the ruling party should not harass Khaleda over her Cantonment house. Soon both parties again developed an understanding on the matter. The issue of the Cantonment house went to the court, and it did not proceed further. Things however started heating up again in December when BNP activists, during the party's council, strongly demanded return of Tarique Rahman, and withdrawal of the cases against him. In February the government decided to change the name of Zia International Airport, and removed the word Zia from the names of more than 50 organisations in one day. Amid a growing bitterness between the two parties, ruling party parliamentarian Sheikh Selim, and Prime Minister Sheikh Hasina herself made some adverse comments on Ziaur Rahman during the parliamentary session that ended in April this year. By then, the internal power structure of BNP underwent a change. The right of centre party was now fully controlled and influenced by hardliner rightist leaders. They succeeded in convincing Khaleda that the understanding with AL was not working, and it would not be wise for her to maintain the soft stance, and to keep away from Jamaat. They also convinced her that the government would surely evict her from the Cantonment house, and would never allow Tarique to return to Bangladesh and join politics again. They convinced her that the government would file more complicated cases against Tarique, implicating him in some heinous acts like the August 21 grenade attack that occurred during BNP's tenure. These hardliners pursued Khaleda to restore ties with Jamaat to announce a hartal and other street agitations, in a bid to mount pressure on the government, so the move to evict her from the Cantonment house is halted; and the authorities, especially the Anti-corruption Commission, keeps away from proceeding with the cases against Tarique and Koko. One of the hardliners, who is a prominent lawyer, convinced Khaleda that the court verdict regarding her Cantonment house might go against her, as the legal basis of the lease was indeed very weak, and the leasing was actually not done through due procedure. That is why Khaleda's lawyers pressed for changing the court, and demonstrated inside the court to delay the verdict, BNP insiders said. With the hardliners calling the shots in BNP, liberal leaders and workers of the party are now very unhappy with the recent rekindling of a warm relationship with Jamaat. They feel it will not be possible for many of them to directly take a position in favour of BNP, as it restored its old ties with a party and people who have allegations of war crimes against them. Meanwhile, BNP began a hectic move to develop its relationship with the diplomatic circle. Several former bureaucrats and diplomats have been assigned to regularly hold meetings with heads of foreign missions in Dhaka. However, one of the important assigned leaders told this correspondent that they have yet to get any positive response from the foreign diplomats in favour of BNP's cause. An East Asian country with a long history of relationship with BNP, rather advised the party leaders who met its diplomats, that they should reorganise the party on the basis of reconciliation. If you spend any length of time in Bangladesh, you're likely to experience a 'hartal'. A 'hartal' is a general strike, typically called by an opposition political party and often enforced (at times brutally) by its youth organizations. During national hartals, the entire country comes to a halt. Though it is rooted in the historic non-violence that toppled the British occupation, today's hartals are more-likely cynical ploys by one political party to hijack the country in order to break down the political process and call for new elections with the hope that they will come out on top in the next round. At the end of last month, opposition leader and former Prime Minister Khaleda Zia (BNP) called a nationwide hartal for 27 June. Urging the rallier to make the general strike successful, Khaleda said, "You wanted a programme for a movement, so here it is. I know movements bring sufferings for the people. But to get rid of the horrible pain this government is inflicting, you must make some sacrifices. We don't have any other option than a hartal, to protest in a peaceful legal way." She alleged that the opposition is not being allowed to speak in the parliament, and their notices are not being heeded, adding, "The people will get an effective parliament if a new election is held after dissolving the present parliament." According to the Asia News report, this will be the first nationwide hartal in three years. By announcing the shutdown, the main opposition leader re-introduced the highly criticised "hartal culture" in the country's political arena after a three-year gap. The last time a hartal was observed on October 28, 2006 by the then opposition party AL, 12 persons were killed across the country. The last time BNP observed a hartal was before June 2001, during AL's last stint in power. As noted in by the Asia News, the ruling Awami League is no stranger to hartal, and used the tactic regularly while the BNP was in power. Earlier this month, Ferdous Rahman wrote for Bangladeshi English-language newspaper, The Financial Express that criticized the practice of hartal for its negative impact on both the national economy and the rights of the people. Hartals are often called in the name of the people, but it is the ordinary people whose movements are restricted, property endangered, and progress curbed. Hartal is apt to curtail the rights of people who are not willing to participate in it. In that sense, hartal is viewed by many as a coercive political right. Hartal is no longer an effective form of protest. In a globalised economy with fierce competition for investment capital and jobs, no country can afford to have confrontational politics. Hartals associated with intimidation, coercion and infringement on other people's freedom of movement are not convincing or credible. Hartal is not the solution of any problem and is economically damaging. Properties are damaged during hartals, work hour is lost and communication disrupted. The cumulative effect of any such losses cannot but be very alarming for the national economy and social order. Today nearly half of the 150 million people of the country live below poverty line though the economy has an impressive potential for pulling millions out of poverty. Political instability remains the key impediment to economic development in Bangladesh. With passage of time, the hope for political stability is becoming more illusory and people from all walks of life are losing confidence on the culture of hartal. It was widely expected that the new regime would bring political stability and end authoritarianism in all affairs of the state. But the reality has been quite different. THIS newspaper since its very inception has opposed hartal during the tenure of both AL and BNP. We observed with dismay how the AL and the BNP loudly professed the evils of hartal while in power but called for it when in the opposition. We would like to make it clear, however, that an imposed ban on hartal will be, if anything, self-defeating and counter-productive. That hartal as a medium of political protest stands discredited for being overused, imposed, thoroughly repugnant to public sensibilities because of negation of free choice and, above all, destructive to the national economy is now a universally acknowledged fact. Historically, whatever rationale hartal has had as a political weapon against autocracy and misrule got lost through its abuse that starkly contrasted with the availability of the outlets for expression of dissent following the restoration of elective parliaments since 1991 and free play of pluralistic press. The big misfortune for the national polity has been that while in the opposition a political party favours hartal, but the party in power abhors it, and tries to resist it leading to confrontation and spiraling violence. The opposition resorts to hartal deluding itself into thinking that even if people stayed put at home to avert trouble it would go down as a mark of success. And, the ruling party taking to street in consequence, a cycle of violence grips the nation. In the process, both the political parties stand to lose public support. Not that they don't realise it, they very much do so; for, the Awami League at one time before election took a firm stand against hartal, and publicly committed that even if in the opposition it wouldn't go for hartal provided the BNP reciprocated in kind. But recently proposed legislation to ban the practice of Hartal is nevertheless controversial. While The Daily Star sees its contemporary use as a self-defeating move, they also believe that in order to move beyond the impasse of hartal, there must be a consensus among the major political parties. That being the shared legacies of hartals and counter hartals by the major political parties alternating between power and opposition, it devolves on them to first come into a bi-partisan agreement on the hartal issue. We find it thoroughly unacceptable however that the ruling party in a one-sided bid has placed a bill in parliament to enact an anti-hartal law. This sounds as coercive as imposition of hartal itself, if not more. This furthermore betrays a sense of using brute majority in parliament which seems simply outrageous. The proposed bill incredibly seeks to punish individuals who force people to observe hartal meaning the pickets. What is even worse, top leaders of political parties who call hartal will be proceeded against along with the pickets. This is certainly not the way to go about it. We are of the strong view that a national dialogue be held with all political parties including civil society leaders by way of eliciting public opinion to reinforce the already-felt need for doing away with hartal. The key element in the whole exercise would have to be provided by the major political parties to come together to forge a common stance against hartal. The question is, can the political parties come together in good faith to eradicate what has been an effective, if only in the very short-term, political weapon? The fact of the matter is that in its current practice, hartal does more harm then good. The economy suffers, the people suffer, the political process suffers. Opposition parties at best obtain a Pyyrhic victory as they weaken they further weaken the political system, increase cynicism and doubt among the people. 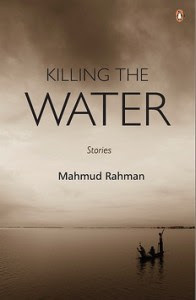 It was with great interest that I read Ulysses' recent blog post about Mahmud Rahman's new book, Killing the Water. The stories cover a lot of ground. They deal with themes ranging from the 1971 War of Liberation to racial violence experienced by a fresh immigrant in the United States. In between, we sample generous helpings of relationships and symbolism, unexpected multi-racial bondings, intimate details of Bangladeshi culture and affectionate remembrances of the way things were in that land in mid-20th century. And as you might expect, lots of water - ponds, rivers, rain, storms and cyclones. Unfortunately, I'm running into the same obstacle that plagues bideshis who years for a little Bangla culture - we can't find it. Amazon doesn't have a listing for the book (neither the US nor the UK stores). I found the listing at the Penguin India website, but when I tried to order it direct I was told that it's already sold out! UPDATE: The book is available for sale worldwide from VedamsBooks.com I ordered my copy today. I just stumbled across this new film by Mostofa Sarwar Farooki, Third Person Singular Number, or 3psn for short. 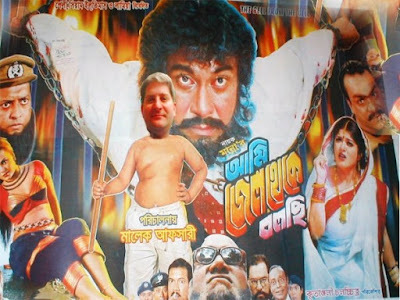 Bangladeshi cinema is virtually unknown in the United States, which is a real shame. There is an incredible amount of vision and talent in Bangladesh that is goes unrecognized. Now for the hard part: Finding this film on DVD. The Daily Star reports that 411 more ‘political’ cases are to be dropped. While it is important that politically motivated cased be purged, let's hope the government takes a cue from the National Reconciliation Ordinance (NRO) fiasco in Pakistan and ensures that illegitimate cases are dismissed with proper due process so that they don't end up part of a vicious cycle of political prosecution. Using the courts to intimidate political opponents is obviously unacceptable. Unfortunately, these things have a way of living beyond their years and popping up again once they become politically expedient. Again, Pakistan's current situation vis-a-vis the NRO is a perfect example of this. Illegitimate cases should be purged through a truth and reconciliation process that brings together all political parties and interests and provides amnesty not only for the wrongfully accused, but the accusers as well. The goal of the process should be to identify lessons from the past and provide a path to move on from these mistakes, not seek revenge or sweep any misdeeds under the rug. As Bangladesh continues to make democratic improvements, efforts must be made in a way that is sustainable for the long-term. This might mean slightly slower movement in some areas, but it will be worth it in the long term to create a path to moving beyond the past and cementing a more democratic future. This is a movie poster that my friend Sunny edited to secure my Dhollywood stardom. I'm quite a natural, don't you think? Hello? Hello? Is this thing on? While this blog has been dormant for some time, the bideshi has not disappeared. I'm thinking of picking things back up and expanding the scope a little bit to include commentary more broadly about what's going on in Bangladesh, but also in Pakistan. Over the past year I've had the great fortune to meet several wonderful Pakistanis who have introduced me to their country and their culture, and I think that the more that we Americans know about these countries, the more we will see that our similarities far outweigh our differences. Look forward to more regular posts, and hopefully some lively discussion with our friends in South Asia. What does bideshi golmal mean? "Bideshi" means foreigner. "Golmal" means something akin to noise/confusion/racket. What's that supposed to mean? It's supposed to mean that this blog is written by a non-Bangladeshi and it probably reads like a bunch of confused noise to a Bangladeshi. Mostly, it's just supposed to be funny. Why do you like Bangladesh so much? The people, the food, the culture, the landscape, the history - there are a lot of reasons. It's just a really fascinating, beautiful place that most Americans, sadly, don't know anything about.